Ninety minutes north of Atlanta, the mountain town of Blue Ridge is becoming a mecca for artists and art lovers. Recently recognized as one of the top five ‘Art Towns’ in the state of Georgia by the Georgia Council for the Arts and the Georgia Municipal Association, Blue Ridge has a historically artistic soul. The epicenter of cultural activity is located just ‘uptown’ from downtown, overlooking the city park. The Blue Ridge Mountains Arts Association and The Arts Center is a magnet in this rural community where mountains and miles often separate neighbors. “Many of my artist friends live in surrounding towns, but everybody converges on Blue Ridge. The Arts Center is our focal point,” said Tom Chambers, an artist who moved to North Georgia and is a very active member, volunteer and festival artist with Blue Ridge Mountains Arts Association. 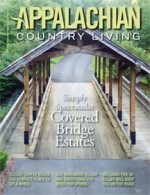 With 1,000 members (50 percent are artists), the Blue Ridge Mountains Arts Association, a 501(c)3 non-profit arts association, with a diverse membership includes traditional and contemporary artists, amateur to nationally recognized professional artists, and individuals who simply enjoy and support the arts. The mission of the Blue Ridge Mountains Arts Association is to provide opportunities in the realm of the arts to the individual but also serve as a catalyst for economic development for their tristate area. The Arts Center, home to the Blue Ridge Mountains Arts Association, resides in the Historic Fannin County Courthouse and is a natural spot to explore the artful side of Blue Ridge, but it’s just the beginning. The Arts Center houses five guilds, six galleries, three classrooms, a pottery studio and an artist residency program. It offers year-round exhibits, workshops, classes and summer camps for kids. It also hosts two national shows, the Southern Appalachian Artist Guild Juried Show and the Blue Ridge Mountains Photographers National Juried Photography Show, which draws in artists from over 25 states. As the weather begins to cool and the foliage begins to show their fall colors, several ‘artist warriors’ revel in the beauty of the season. For these artists, September ushers in the Annual Fall Plein Air Event hosted by the Blue Ridge Mountains Arts Association and in partnership with the International Plein Air Paint-Out. This year’s Fall Plein Air Event will be held September 10 – 13, 2015 and will include workshops, paint outs, quick draw paint outs, and is offering over $1000 in prizes thanks to their sponsors Binders Art Supplies and Framing and Mercier Orchards. 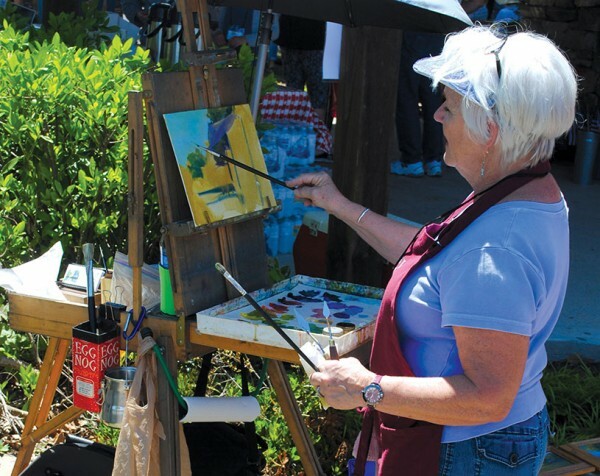 Throughout this four day event, artist will take their paints, pastels, canvases and easels out into ‘plein’ air braving the elements to capture the breathtaking beauty of Fannin County. With over 43 percent of the county designated as National Forest, stunning downtown district, orchards and wineries abound, the Plein Air artists are in no short supply of subject matter for this incredible weekend. Also in fall, the Blue Ridge Mountains Arts Association hosts their famed Fall Arts in the Park festival. The Arts in the Park festival series, which attract over 20,000 visitors annually, provides one of largest fine arts and crafts festival in the North Georgia area. The Spring Arts in the Park is held Memorial Day weekend each year and the Fall Arts in the Park Festival is held every second weekend in October. This year’s Fall Arts in the Park festival will be held Saturday, October 10th & Sunday, October 11th, 2015. The foundation of Arts in the Park festivals began with a clothesline in the park with several community artists and Fannin County high school students & teachers providing an artistic display to showcase the wealth of talent of our area. In 1976, a few local area artists, art enthusiasts students and educators joined together and created a small arts festival to celebrate the Nation’s Bicentennial and the rich culture of our mountain town. Mostly comprised of local student art and few craft demonstrations, the ‘Blue Ridge Art in the Park’ event was born. Based out of the Blue Ridge City Park and in a community rich with traditional crafts such as quilting, wood turning, and wood carving, the ‘Art in the Park’ event was to showcase local area artist, Appalachian student art work and area crafts. ‘Arts in the Park’ was held the following year and highlighted the need to begin the development of an arts association for Fannin County that would provide cultural and artistic opportunities not only for the local community, but for the region. Arts in the Park was the inspiration for the creation Blue Ridge Mountains Arts Association, now entering their 35th year as Fannin County’s tri-state arts association. After two years of grant writing, community efforts, and support by the Georgia Council for the Arts, the Blue Ridge Mountains Arts Association was established in 1980 and the official charter declaring us the Blue Ridge Mountains Arts Association was signed by over 200 founding members. The original signed Blue Ridge Mountains Arts Association charter is hung proudly and prominently in the Art Center today. That same year, Blue Ridge Mountains Arts Association became the official host of the ‘Arts in the Park’ festival. The Arts in the Park Festivals were moved under the direction of The Art Center in order to ensure the festival’s continuity. Flash forward almost 40 years and Arts in the Park has become one of the most reputable and longest running arts festival in North Georgia. In 2000, the Blue Ridge Mountains Arts Association began a new festival titled Wildlife and Nature Festival and Expo. This new fall festival was meant to highlight the beauty of wildlife and nature but also showcase artists who captured the elegance of nature and wildlife. With a variety of demos such as owl hunting and dog herding demonstrations, this festival provided the public to see wildlife up close and personal while showcasing the high caliber artwork of nature-based artists ranging over a variety of mediums including traditional painting and drawing to the fiber arts and gourd art. For over 10 years the Wildlife and Nature Festival and Expo gave a unique festival experience to Fannin County. As the economy changed and the continued growth of new artists in the region, the need to expand the Spring Arts in the Park was hard to ignore. To accommodate that need, in October 2011 the Wildlife and Nature Festival converted to the Fall Arts in the Park Festival. In assessing the strengths of The Art Center, it was determined the Arts in the Park Festival series was the primary economic strength of the organization. The Arts in the Park Festivals are all juried and only the finest of arts and crafts are allowed entry. No manufactured items were allowed and only original work created by the hands of the artists would and is shown. It was estimated in 2013, based on an Americans for the Arts (AFTA) calculation, the Arts in the Park festival series provides an estimated $500,000 annually in economic impact to our community, fulfilling our mission of providing opportunities and accessibility of the arts but also serving as a catalyst for economic development for our community. For over 30 years, these festivals were free to the public, but after a very difficult realization that in order to survive, the Blue Ridge Mountains Arts Association would have to begin charging admittance to these festivals. These festivals are a source of pride for the community and have brought in thousands of tourist each year, which fed the dwindling mountain economy. Hard decisions had to be made and steps were put in place to help make a big difference in the financial stability of The Art Center and, ultimately, to the tourism economy of this mountain community. Currently, there is a $5 admission for adults to the Arts in the Park festivals which provides access to the festival for the entire weekend. All proceeds from Arts in the Park festivals helps to ensure the continued growth of Blue Ridge Mountains Arts Association programming and The Art Center’s operational costs. In Spring of 2016, the Blue Ridge Mountains Arts Association will be celebrating their 40th Arts in the Park Festival and plans to continue to host this annual festival series in the downtown city park of Blue Ridge, Georgia just like its inception in 1976. However, the festivals have grown from its humble beginnings to over 175+ of the finest artists in the country. The Blue Ridge Mountains Arts Association has continued to provide the local community and area visitors with opportunities in the realm of the arts, accessibility of the arts, and continued support to honor the rich heritage of the North Georgia Mountains. Blue Ridge Mountains Arts Association has grown exponentially from its humble beginnings in 1976 with the help of countless dedicated individuals and supporters. Blue Ridge Mountains Arts Association has helped make Blue Ridge, Georgia one of the top five towns in the state of Georgia. The depth and breadth of the Blue Ridge arts community has advanced the Blue Ridge Mountains Arts Association’s goal of being designated as an Art Town with having already achieved recognition from Georgia Trend magazine as a top “Arts and Leisure Community” in 2013. This year, Blue Ridge and it’s arts community received the proud designation of being named one of the top five art towns in Georgia by the Georgia Council for the Arts and the Georgia Municipal Association, helping further the Blue Ridge Mountains Arts Association’s vision of establishing Blue Ridge as one of the top Art Towns in the United States. With the Blue Ridge Mountains Arts Association celebrating 35 years in 2015, it brings us full circle back to the Arts in the Park Festivals. Those high school students, teachers and community members had a vision to create an arts culture with the Arts in the Park Festivals as the beginning of this incredible artistic journey. These festivals have contributed to the town of Blue Ridge, Georgia achieving the status of an art town community, establishing a haven for artists and arts lovers via the Blue Ridge Mountains Arts Association, and creating an arts experience unparalleled in this Appalachian Region. Through the efforts of many, an Art Town was created. The Fall Plein Air Event will be held September 10 – 13. For more information and registration visit www.BlueRidgeArts.net. The Arts in the Park Festival series takes place in the downtown Blue Ridge City Park. This year’s Fall Arts in the Park will be held October 10 and 11 from 10am-5pm, rain or shine. There is a weekend festival admission charge of $5 for adults, but children under 12 are admitted free. All proceeds from this festival help to fund the arts programming provided by the Blue Ridge Mountains Arts Association. These funds are the primary source of income to help support the Blue Ridge Mountains Arts Association mission and continue the Art Town Vision for Blue Ridge.